Say hello to Proporta. 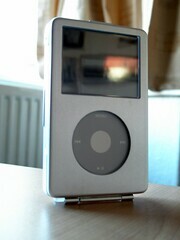 One of many iPod case manufacturers providing quality cases for the entire line of iPods old and new. Using information from their customer base they’re able to design and put to market, solutions that are catered for the individual needs of their customers. We’ve been sent along two cases from Proporta to review and so on with the review. At first glance you will probably find that this case is similar in design and styling to many others. The case we reviewed from Capdase a couple of weeks back is almost identical to this with a few slight differences. However do not let that deceive the naked eye. First of all, the material is different. I’m no expert on what real leather feels like or what to look out for but the Proporta case just seemed to feel a lot softer. The white hand stitching also added a nice finish similar to the XtremeMac MicroFlip. The lack of a belt clip is without doubt a bonus feature for someone like me. I hate belt clips! When you want to put the case in your pocket, you often find with these cases that the clip part protrudes out and often causes great pain when it’s in your trouser or jeans pocket. So with no option to add on a belt clip is a tick in my books. The lid is in a flip-open style and is held securely in place with a button. The inside features the same leather material and hand-stitching. A neat design and although I’m not sure whether its a design feature, you could quite easily slip two credit cards in to the two separate pockets located in the lid. No screen protection or scroll wheel protection when the lid is open but then again you’d only need protection when the case is closed which the flip lid does a very good job of. Overall this case is built and designed with durability and quality in mind appealing to those who are looking for a quality leather case that is compact, portable and with good secure protection. You can be confident that your iPod is going to be well protected if you ever drop it. Introducing the Proporta Aluminium Metal Case finished in Silver. 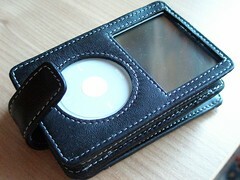 Your iPod looks like a bouncer at the club door when you put it in this case. Made of light aluminium and with a padded interior and plastic screen protector, it’s the Hummer vehicle of iPod cases. The design of the case does make the iPod appear bigger and bulkier and it looks like your iPod could probably survive some pretty hard knocks. The scroll wheel, headphone and lock areas are exposed for convenient access which is a plus but they are still sufficiently protected. The iPod clips straight in and stays very secure even when the lid is open. The case splits in half with the top part hinged to the bottom part but unfortunately this case does have the belt clip part so if you’re a belt clip fan then I guess this is fine for you, but for those who would like to put their iPod in their pockets, be prepared for some injuries if your iPod gets pushed against your body. Your iPod will survive but your leg may not. It’s only minor and it is found on many cases for iPod cases from many if not all iPod case manufacturers. So you can’t really fault Proporta too much for this. But my other question that I propose is who uses belt clips these days? Some final closing comments would be that Proporta clearly make good quality cases. These are the ones you should look out for if you’re in the market for an iPod case and I can’t recommend them enough. Overall they’ve got excellent quality in both simplistic design and are great at the core proficiency, and that is to protect and serve your iPod!